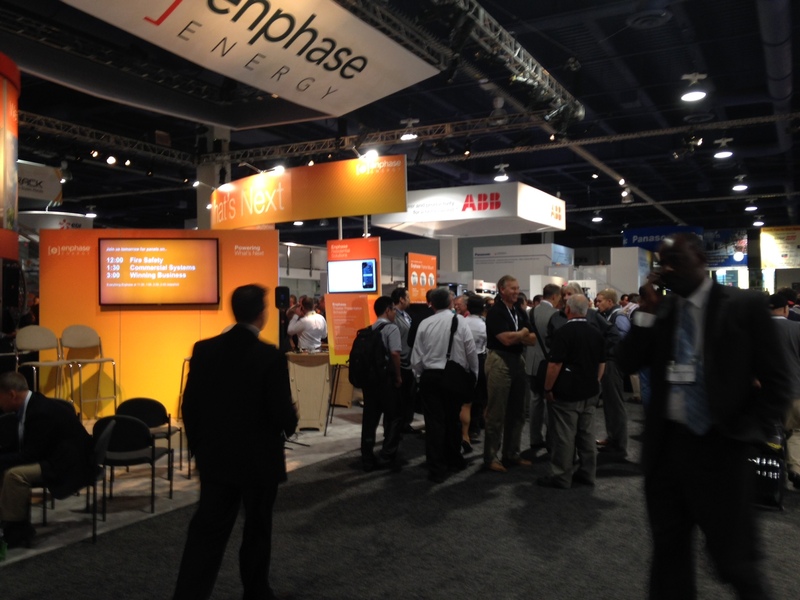 “It was the best of times, it was the worst of times,” so Charles Dickens wrote, and the same might be said for Enphase and RECOM, two solar exhibitors that were across the aisle from each other at this year’s Solar Power International. I passed their booths several times, and every time I did, Enphase had almost wall-to-wall traffic, while RECOM’s side was nearly empty, but why? Let’s explore their differences and try to figure it out. Location and Size: Location and size aren’t the only factors for successful booth traffic, but they certainly help to draw more attention as you enter the show floor. But both Enphase and RECOM reserved similar size foot prints and both had the exact same advantage of being near the front and on the main middle aisle. Consequently, we can’t say that Enphase has more traffic because it had a better location than RECOM, so let’s look at other factors that set them apart. Brand Recognition: Enphase is certainly a brand leader in the micro-inverter space, and RECOM is a relative new entry to the U.S. market. So one might argue that Enphase has more customers and brand recognition than the European-based RECOM. 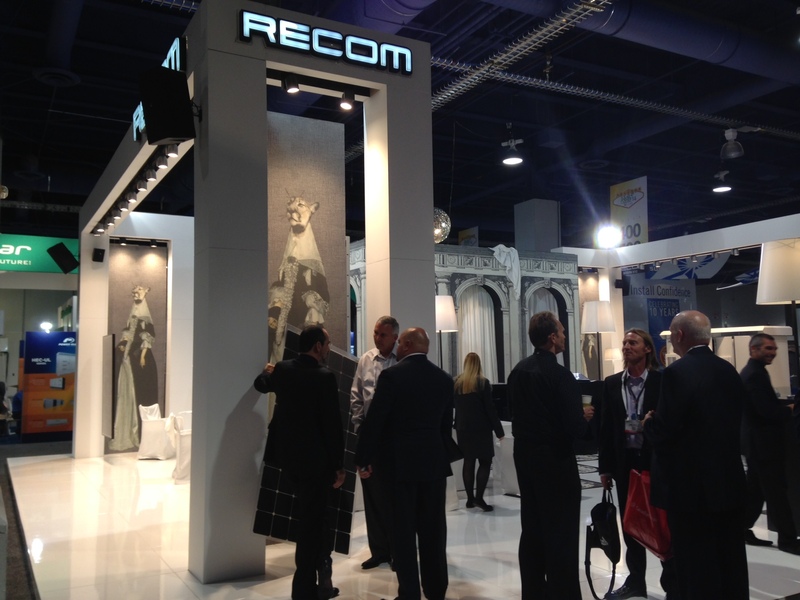 Then again….RECOM is everywhere at the show. That is, for two years running, RECOM has paid for premium signage all over SPI in Chicago and now in Las Vegas. You literally can’t walk down any aisle at SPI and not see RECOM’s brand, since it hangs above on every banner that identifies the aisle numbers. The brand really seems like it’s everywhere, and hence, they have plenty of brand recognition at SPI. People know who they are and that they sell solar panels, but that’s apparently still not enough to drive people to the booth to find out more. Here’s where I think the real differences are: Enphase has designed their booth to stand out and educate their customers, while on the other side of the aisle, RECOM seems to have built their booth to just stand out with very little education about their products. In one area, they have ongoing presentations about their products and services. In another area, they have a challenge activity that has installers competing to see who can install Enphase microinverters faster. In the largest area, they have a product showcase. Fourth, the back of the booth has a one-on-one tech support table that’s designed to be the equivalent of Apple Store’s “Genius Bar,” where IT/gateway communications questions/concerns are answered. Of course, traffic was also enhanced at the end of the day with a happy hour with premium beers. (At solar conventions, good beer always draws a crowd.) Also, booth staffing was filled with knowledgeable Enphase product managers and sales people, not models, so customer questions could be answered by the anyone with an Enphase logo on their shirt. Now, let’s take a look at the RECOM design and activity side. RECOM depicts cats as royalty this year, and I suppose that’s supposed to reflect high quality panels, but for me it just seems like an odd booth graphic. 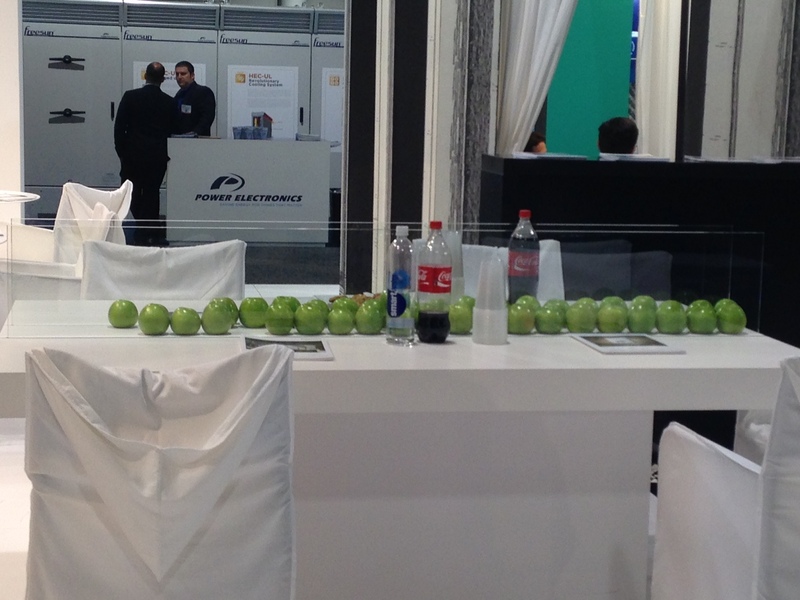 Another oddity is placing a bunch of green apples on a single table. Why? What do they have to do with solar? In past shows, I’ve seen lemons as part of their design theme, and I just don’t understand why these pieces of fruit, though colorful, should draw anyone into their booth. It just seems out of place and meaningless, especially when surrounded by refreshment bottles. Rather than any product seminars, RECOM’s only educational component seems to come from models in high heels passing out one-sheet spec brochures. Aside from the fact that many U.S. solar industry people think that this “booth babe” marketing tactic is disrespectful to women, shouldn’t knowledgeable solar sales people be the ones passing out spec sheets and engaging with passing installers? 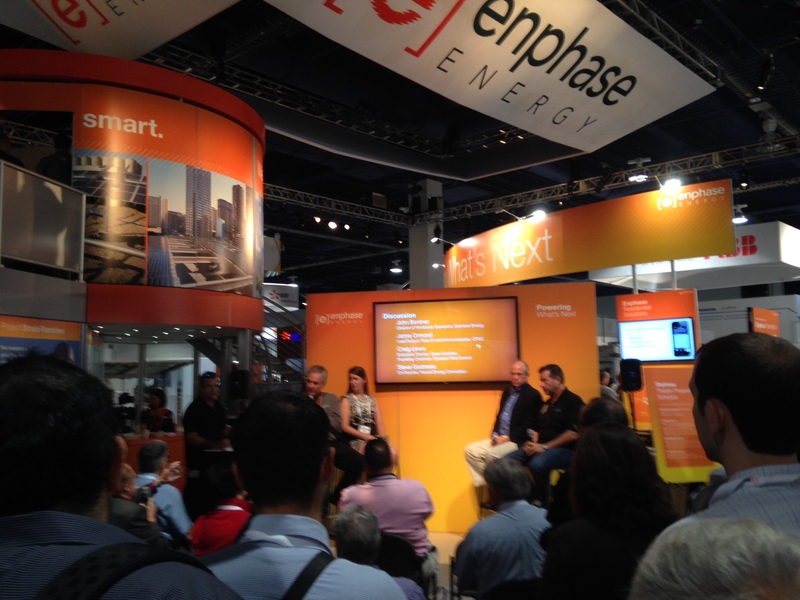 Meanwhile, on the other side of the aisle, Enphase created an atmosphere that was not only friendly and inviting, but also educational and entertaining to its SPI audience of installers who are looking for solutions to their problems, not just entertainment. As a result, I think that’s why its both was much more successful and attracted so many visitors throughout the day. Next week, Part II where I’ll post some more SPI solar event marketing hits and misses that I saw at the show. Until then…UnThink Solar. Tor, this is right on. I spent a lot of time at the Enphase booth, not only because of the ongoing educational opportunities, but because of the welcoming and colorful atmosphere at the booth. I felt encouraged to enter and see what was going on. It was also a shame that several times the music from surrounding booths was so loud you could barely hear the presenters from Enphase. I think a little bit of couth from other exhibitors could have easily solved this problem and encouraged more traffic. The branding at Recom’s booth was odd and felt unrelated to solar. I avoided eye contact with those at the Recom booth because it felt uncomfortable, and there wasn’t anything to draw me into the area. I’m hopeful that Recom can take a new approach at future shows to better reach the American solar market and provide information about why they are invested in doing business here, and why we should be encouraged to do business with them. Thanks, Kendra! More good advice for them. I always find it comical to read these articles – usually written by a frumpy, disgruntled individuals – bashing “booth babes”. First things first – trade show models, convention hostesses, booth staff or talent – NOT booth babes! 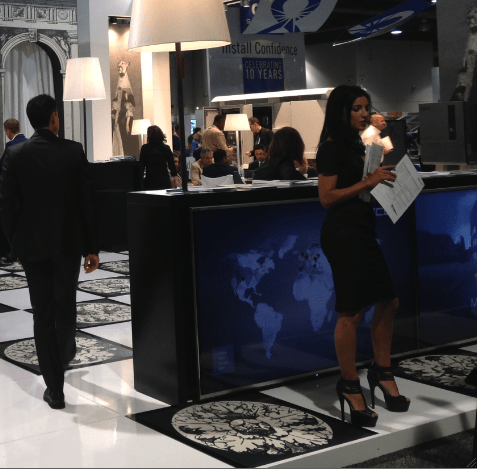 Whether you agree with their presence or not, trade show models have been around for decades and it is a proven marketing tactic that works. It’s called marketing and all major companies & brands use it. I am sorry that your closed mind cannot see past the fact that these women (and sometimes men) serve a valuable purpose in generating consumer interest, booth traffic, leads and closing sales for the companies they represent. What you – an outsider – don’t realize is that most of these women are either usually college educated and/or working their way to through college. I’ve seen women with JD degrees work as trade show models while interning as law clerks. Additionally, they are usually required to attend extensive company training and become an expert on products in a short amount of time. More importantly, many of them are full-time trade show models and hostesses, working to make honest livings. For you, these are just hot girls standing at a booth. For them and the staffing agencies, this is their livelihood and a significant part of the local economic & industry revenue. Would you feel better if they were unattractive? While I have seen some companies push the preverbal envelope when it comes to attire, I guarantee you’ve seen worse at your local pool. The majority of the time however, it’s usually branded t-shirts and pants. Either way, who are you to say what is valuable to the trade show industry? Because these women don’t sit behind a computer and write about renewable energy all day, does that make your purpose any better than theirs? These woman have the opportunity to not only serve as a spokesperson for the companies and brands they represent, they are educated spokespersons that have direct contact with potential consumers. If anyone is demeaning and degrading them, it’s you. Undermining their presence and taking away from their value out of sheer jealousy is pathetic. These women that are hired for trade shows are there on their own free will and usually all of them enjoy what they do! If it’s not hurting anyone or anything, if the practice is adding to the local economy and the companies that use the tactic see growth… why are you so bothered? Bottom line – worry about yourself. 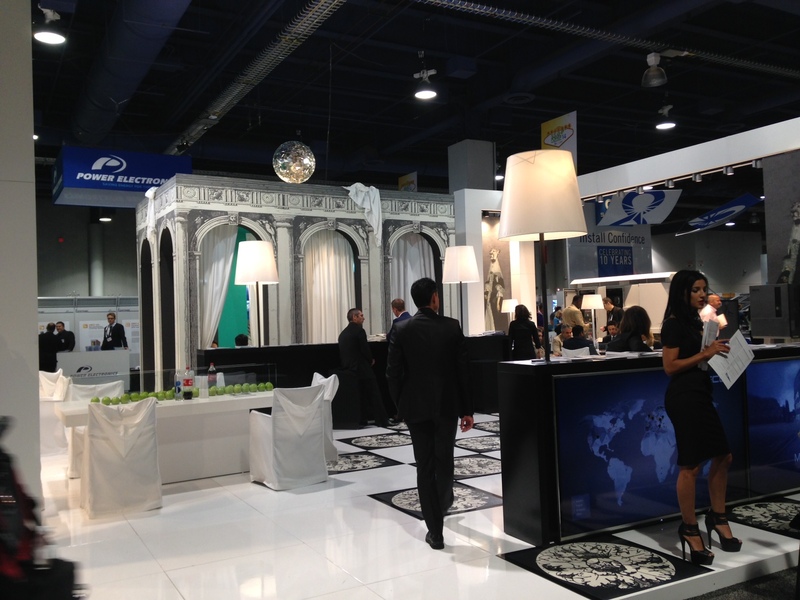 Recom uses trade show hostesses every year and every year they see growth at many of their shows. Stop concerning yourself with what these women are doing and how they choose to make their livings. Aggie, I’m not bothered at all by beautiful women and I don’t doubt that these women are intelligent as well as beautiful. However, as a solar marketers, our #1 concern is to serve the needs of the target customers. If these women were trained and educated about Recom’s solar products and actively solicited passer bys to engage with them about their panels, that would be one thing. As it is, they just stand there and are simply decoration. I support models making a living, but I do not support marketing efforts that ineffective. This example of a very busy booth with educated representatives (Enphase) compared to Recom’s booth at virtually the same exact location shows how ineffective this tactic is. For other products, they may be more effective. At this booth for solar, clearly they were not.